Gutters have it tough. In March, many gutters were iced up and filled with snow, causing the plastic to contract and now in July, your gutters could see up to 20mm expansion each day and night as we see temperatures reach 30 degrees. The rubber joints are designed to accommodate this, with the lengths sliding over the seals, but if one sticks, another might pop out causing a leak. Keeping your gutters clear and in good order will help prevent this. 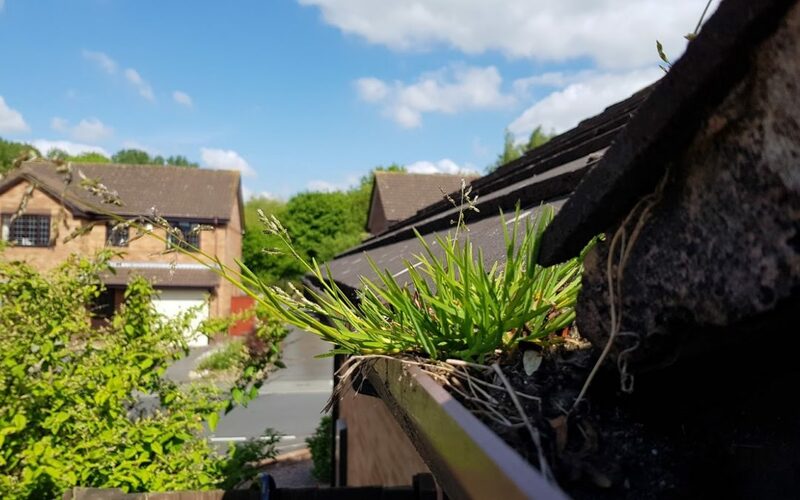 By keeping your gutters empty of moss, plant growth and weeds, you are reducing the weight your gutters need to cope with, and when that storm inevitably arrives, the water can find it’s way from your roof into the drains with no blockages, adding weight to your gutters. 1 litre of water weights 1kg, so a standard run of guttering, if it were blocked, could easily have 10 kilos of weight. Most gutters are clipped in by plastic brackets, which in turn are screwed into fascia boards – often by small screws – and are not designed to hold much weight. A simple visual inspection of your gutters from the ground may reveal some plant growth this time of year. You can be sure that if you can see growth from the ground, there is a lot more you can’t see. It takes only a short time for plants and weeds to take hold this time of year. Once the flow is reduced, the build-up of debris that weeds love is accelerated and flow reduced even further. A vicious cycle that soon leads to problems. Is it time to give your gutters a clear out?